20 years experience in writing and designing programs for a wide range of clients from FTSE 100 companies to SMEs. Passionate for exceptional customer service and in generating that enthusiasm in others. A real skill in providing the link between where the client is now and where they need to get to in the future. Jackie's training career started as head of the cardiac department at St Thomas Hospital and went on to be one of the most successful trainers in British Airways. After this Jackie spent 14 years as a lead trainer for one of the top international training organisations in the UK. Jackie is now a highly successful independent management consultant. She has written and designed many courses on behalf of clients in the banking, property, legal, media, accountancy, and public sectors. Jackie has been closely involved in the initial concept, planning and launch of Helpsme. 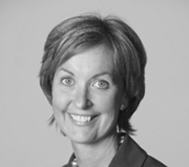 She is a non-Executive Director of the Helpsme and remains highly active in the company's growth and future. Jackie has always had a keen interest in the outdoor life, and in particular in competitive show jumping. Her creative flair has led her to re‐design her home, which has featured in a number of leading magazines.